The Veil Nebula in Cygnus is the remnant of a long-ago supernova explosion. The object is conveniently positioned in the summer night sky. Viewed from Earth, the expanding bubble of gas appears as curved sections of wispy strands. At six full moons across, it's too large to see all at once in a telescope. Instead, enjoy one section, and then jump to another – or take a long-exposure photograph. Amateur Richard D. Jacobs used a CCD camera on a wide-field telescope to capture this image, but you can use a tripod-mounted DSLR camera, too. Supernovas, or stellar explosions, are among the most exciting events that astronomers can observe. Such an event occurs when a massive star becomes unstable and explodes in a violent blast of light, radiation and matter, flaring to maximum brightness in a few days and then slowly fading away, leaving a stellar corpse of exotic radiation and matter. The explosions temporarily outshine all the other stars in the detonated star's galaxy combined, and the resulting intense pressures fuse atoms into heavy elements that are seeded throughout that galaxy for inclusion in future stars and planets. For example, every atom of gold in your favorite piece of jewelry was forged in a long-ago supernova explosion. During their lives, all stars maintain a balancing act. The energy produced by the fusion reactions in the star's core keep the object from collapsing under its own mass. When the available fuel in the core drops below a threshold, however, the fusion ceases and gravity causes the star to collapse inwards. In a small star, like the Earth's sun, the core compresses briefly and then returns to its original size. Because of this rebounding effect, the surrounding layers of the star are pushed away, leaving the naked core to cool down as a white dwarf. Inside stars that are larger — between about 10 and 30 times the mass of the sun — the collapsing core is rapidly compressed to an extraordinary degree. Protons and electrons are squeezed together to form neutrons, resulting in a spinning neutron star. In even larger stars, the matter in the core is compressed to infinite density, forming a black hole. Meanwhile, the rest of the star is expelled violently, at speeds of up to 10 percent the speed of light. The resulting shock wave releases the energy of a billion suns, briefly outshining the rest of the stars in the host galaxy. The merging of atoms at such high pressures and temperatures synthesizes heavy elements that spread into the surrounding interstellar medium. Those elements are eventually incorporated into future stars and planetary systems. Visually, a supernova ramps up in brightness over about 10 days, before dimming over several months. The astronomical term "nova" (Latin for "new") was coined in 1572 when Danish astronomer Tycho Brahe observed the sudden appearance of a new naked-eye star in the constellation Cassiopeia. This star was visible during the daytime for about two weeks, starting out brighter than the planet Venus and then gradually dimming until the object was lost from view in 1574. In Brahe's time, the astronomical telescope had not yet been invented. After its development, and as the instrument improved over the centuries, astronomers observed more novae, and their dimming could be followed for months and years. Walter Baade and Fritz Zwicky proposed the term "supernova" in 1934. The astronomers realized that the novas they saw in other galaxies must emit orders of magnitude more energy in order to be visible at such great distances. Supernovae are the death throes of a star much more massive than our sun. Some of the star's mass is converted to energy, yielding flashes of light that temporarily outshine the host galaxy. The core of the star collapses to a spinning ball of pure neutrons – or even a black hole. The rest of the star is blasted into interstellar space to seed future solar systems with heavy elements. Supernovas leave exotic remnants behind for astronomers to detect in the night sky. Sometimes, these events produce spinning neutron stars that generate tremendous magnetic fields. The neutron stars emit beams of energetic radio waves and charged particles that scientists detect as pulsars in radio telescopes. The star explosions can also leave black holes: Matter circling and falling into the black holes heats up due to friction and generates X-rays that orbiting space observatories like Chandra can observe. And skywatchers can use telescopes to observe the shells of debris from nearby supernovae until the shells eventually dissipate after between 10,000 and 100,000 years. This week, amateur astronomer Patrick Wiggins of Tooele, Utah, discovered a new supernova using his 14-inch (0.35 meters), f/5.5 reflector telescope and CCD camera. After comparing earlier images with an image of the sky he captured on May 14, he noted a new "star" outshining all of the others in one of the spiral arms of a galaxy in the constellation Cygnus. The new supernova, designated 2017eaw, flashes on and off at upper right in these two images taken of the Fireworks galaxy (aka NGC6946) in 2011 and on May 14, 2017. The discovery by amateur Patrick Wiggins of Utah was his third supernova, and the tenth to occur in that galaxy during the last 100 years. For now, the supernova has been designated "2017 eaw." The exploding star occurred in the outskirts of the galaxy designated NGC 6946, also known as the Fireworks Galaxy. The name is apt: This is the 10th supernova to occur in that region in the last 100 years. The galaxy is located about 8 million light-years away from Earth. NGC 6946's orientation in the sky is nearly face-on to Earth, which allows terrestrial observers to see the entirety of the Fireworks Galaxy's beautiful spiral form all at once. Once a potential new supernova is announced, other astronomers and observatories spring into action, confirming the object visually and measuring the wavelengths of light they release, called spectra A group based at the Xinglong Station of National Astronomical Observatories of China (NAOC) has announced that Patrick Wiggins' supernova is likely still a week away from reaching maximum brightness. If the supernova brightens as expected, amateur astronomers and skywatchers should be able to see the object using backyard telescopes. Observing the host galaxy will require a telescope of at least 4-inch (100 millimeters) aperture, but 8 inches (200 mm) or higher is better. Your favorite astronomy app can help you find the supernova. In the app's search menu, look for NGC6946 (or Fireworks Galaxy, or Caldwell 12) and select it. Depending on the app you use, the program will show that part of the sky or provide an arrow to guide you in aiming your mobile device. The Fireworks Galaxy, home to the newly discovered supernova 2017eaw, is visible once the sky is fully dark. Your astronomy app will help you use the bright stars Deneb and Alderamin to locate the object. For observers in midnorthern latitudes, including the continental U.S., the galaxy is circumpolar, meaning it never sets. You will want to wait for the sky to darken fully, after 10 p.m. local time. Throughout the night, the galaxy rises higher. So, observing before dawn will reduce the amount of distorting atmosphere you are looking through. Astronomers never know when the next supernova will appear, or where. To keep tabs on these events, watch the websites of astronomy magazines such as Sky & Telescope and Astronomy, as well as here on Space.com. Bright supernovas that occur in relatively nearby galaxies can sometimes be seen while they are occurring using backyard telescopes, but the observing window usually lasts only a week or so. And the host galaxies are normally too dim to see unless you use a large-aperture telescope of 8 inches or higher, or observe under very dark skies. Using a detailed sky-charting app such as SkySafari 5 allows you to zoom in on the galaxy and compare the stars seen through the telescope with those shown on the app. The extra star will be obvious. The Crab Nebula, aka Messier 1, is the remnant of a supernova that was observed and recorded by Ancient Chinese astronomers on July 4, 1054 AD. Located in the winter constellation of Taurus, in binoculars and small telescopes it appears as a faint fuzzy patch about one-quarter of the moon's diameter. But five advanced telescopes have captured it in a variety of wavelengths — its spinning pulsar's radio signal, its visible gas and dust, and the X-rays from charged electrons. An easier option is to look at the remnants of supernovas that occurred locally within the Milky Way. These still-expanding shells of debris glow due to the ultraviolet radiation generated from a spinning pulsar inside the shells or the energy released as the explosions' shock waves plough into interstellar gas clouds. From the Northern Hemisphere, two very nice remnants in the Milky way are observable using binoculars and telescopes. (You can also try taking long-exposure photographs.) Your astronomy app will contain a wealth of information about these famous and beautiful objects, along with and high-resolution color images. The Crab Nebula, also known as Messier 1 (M1), is located in the constellation of Taurus. Chinese astronomers of the Sung Dynasty recorded that they observed a "guest star" that appeared in the sky on July 4, 1054. It was extremely bright — four times brighter than Venus — and it could be seen in broad daylight for 23 days! Afterward, it remained visible in the night sky for two more years. In the middle of the 18th century, a small nebula was discovered in the same area, and it became the first item in Charles Messier's catalogue of comet-like objects. It wasn't until 1928 that Edwin Hubble made the connection that the nebula was the remains of the supernova the Chinese had seen a thousand years before. The Crab Nebula is located 2 degrees from Zeta Tauri, the prominent star that marks Taurus' lower horn. In binoculars or a small telescope, the Crab Nebula appears as a small, dim, fuzzy patch less than one-quarter of the moon's diameter across. It is best seen when it is positioned high in a very dark sky, especially during new-moon periods in winter. Larger-aperture telescopes reveal proportionately more detail. Situated in Cygnus, the Veil Nebula, also known as the Cygnus Loop and NGC 6960, is another supernova remnant, but it is very different from M1. For starters, it is enormous: approximately six moon diameters across! The debris shell has been expanding for more than 5,000 years and has started to disperse, leaving curved sections of veil-like streamers. In a telescope, one has to sweep along the veils, tracing the broad shell along one half, then jumping across to the other side. Due to the wavelengths of light emitted by the nebulosity, an Oxygen-III filter works best to see the glowing gas. 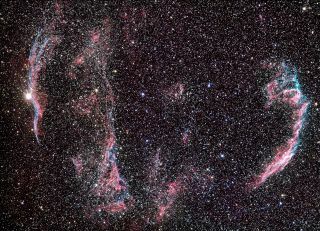 A supernova remnant, the Veil Nebula, also known as Caldwell 33 and NGC6992 and 6995, is located in the summertime sky just to the west (to the right) of the swan's lower wing. In the sky, the object covers an area about six full moon diameters across! Sitting so close to the plane of the Milky Way, many other beautiful nebulas are located nearby – perfect for viewing in a large telescope. The Veil Nebula is perfectly positioned for viewing from now though late summer. Start about halfway between the second and third stars that form Cygnus' eastern (or lower) wing and scan a little to the right (in the direction of the bright star Altair). Once again, a very dark sky is needed to make the Veil Nebula viewable through a smaller telescope or even strong binoculars. But if you can attend a star party where very large telescopes are available, request the Veil Nebula, and marvel at the beauty derived from the violence that occurred there! You can discover new supernovas yourself! Researchers have invited citizen scientists to look through pairs of images taken by the 51-inch (1.3 m) Skymapper telescope at the ANU Siding Spring Observatory in Australia and report any new "guest stars." Experts will double-check your results, and you'll receive a co-discoverer credit on any new supernovas. Visit the Zooniverse.org site for more information. Good hunting! In future columns, we'll tour the southern skies not visible from the Northern Hemisphere, suggest some spring binocular objects, talk about galaxy types and do more. Until next time, keep looking up!